We believe that living a healthier, happier and blissful life is possible. Our Inner Wellness Team will pamper you with personally tailored Massage Therapy Treatments, Hand and Foot Services, Raindrop Therapy Treatments, Reiki, Full Body Treatments and Exfoliation, Nutrition and Wellness Education. Celebrate Birthdays, Private Corporate Retreats, Bridal Parties and other special holidays and occasions at TruBLISS. We’re happy to design your perfect package! Let us use our personal touch and our organic products to help you with feeling great and looking fabulous! Offering a wide variety of services including, Full Hair Treatments; Cut, Colour, Blow-Dry, Styling, Facials, Makeup Application, Makeup Lessons, Medical Aesthetics. Extend your relaxation experience in our Tranquility Lounge or Meditate in our BioMat Bliss Room. 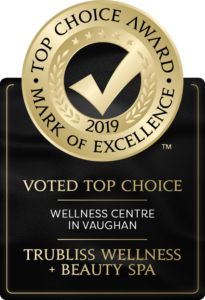 A “Follow Your TruBLISS” Membership is a gift that keeps on giving with monthly wellness inspired therapies, bonuses and perks. All treatments have been designed to promote Relaxation, Rejuvenation, Holistic Healing and a Healthier Lifestyle. High quality skin care lines such as Eminence Organic Skin Care offers a truly exquisite experience and multitude of corrective solutions. We look forward to pampering you in our beautiful, relaxing and private sanctuary. We believe in building happier, healthier and harmonious communities around us. We make a difference every day in the lives of our clients, each other and ourselves.